Artful Affirmations: Tea Cup Tuesday-Happy June Giveaway! You can enter the giveaway for this cup by commenting on this post. You only need to be a follower to enter. I wish you all luck, and wish I had enough prizes for everyone. I am thank full for each and everyone of you. The giveaway month is my way of saying thank you! Each week I am adding more items to win and they will all be awarded by the end of June. You can sign up for one or all the items to win! I searched my china cabinet for the most summer like looking tea cup and this is the one I picked. I love the sky blue color and all the flowers in the cup! See the lovely elegant loop handle outlined in gold. The flowers and ferns in the bottom of the cup are a true delight! 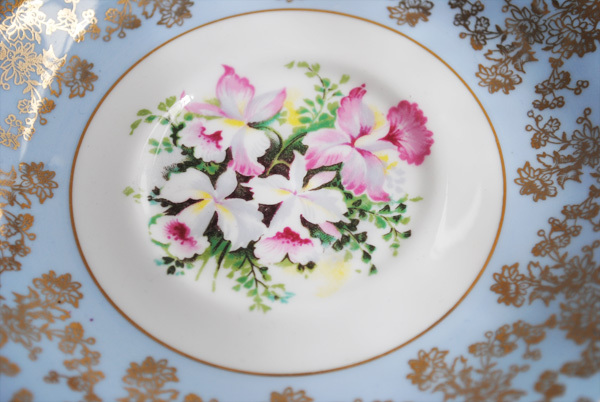 Here are the flowers on the plate as well as flower filigree pattern around the plate in gold. This cup was manufactured by Queen Anne a name made by Shore and Coggins in Longton England. They created china from 1911 to 1966. Bell and Princess Anne are two other names they created china under. This backstamp was used from 1950 to 1966. So it is not an old cup, only about 50 years old or more (like me!). If you would like to join in and share one of your tea cups with us, just go and create a post with your tea cup in it and then come back and sign up with Mr. Linky. Just fill in the two blanks. Martha and I love hosting this tea cup party, we love meeting all of you and visiting your blogs and seeing your tea cups. We enjoy hearing about companies we have not known before. We love seeing the backstamps too. I love your blue tea cup and since I don't really have a blue one, except for a demitasse, please put my name in the hat. It really is lovely. Thanks for hosting and have a wonderful week. Oh, I'm a follower too. Absolutely lovely! I am a foloower as well...would love to add that to my collection! How exciting! Oh Terri, What a beautiful Cup and Saucer! I would LOVE to be included in the giveaway! Thank you so much for sharing and hosting AND having a fun giveaway! Very pretty tea cup! The colors make me happy! I do follow your blog. Hi Terri...Happy Teacup Tuesday...Oh I just love your Queen Ann teacup...so soft and feminine! 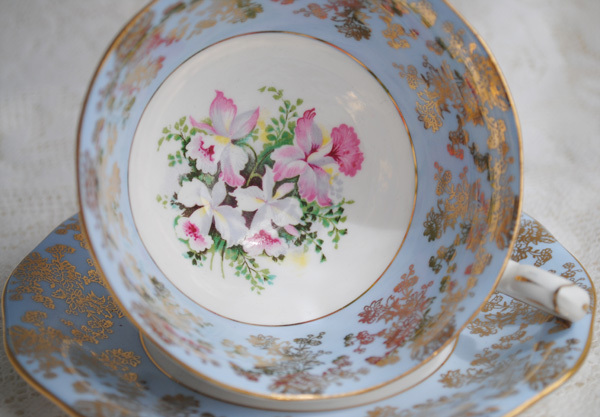 where do you find these gorgeous teacups? the colors you find are really awesome!! Hope you'll stop by and enter my giveaway! Blue is so lovely and a color that I do not have in a teacup yet but have been looking for the right one! Please feel free to link up to Tea Party Tuesday! Thank you for hosting I love following this inspiring blog. Oh silly me I forgot to say... please enter me in your giveaway... I got to excited. I think I'm already a follower but will make sure! What a lovely blue tea cup. I love to be entered for the chance to win. Thank you for the chance. 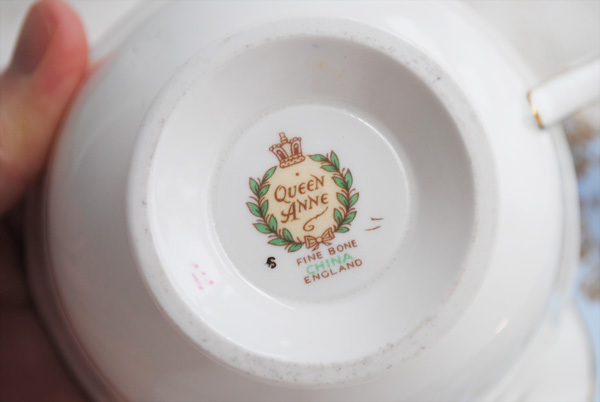 Oh I just love that queen ann tea cup!!! You have such lovely things. Thanks for sharing and please put my name in your drawing, thank you. What a pretty cup Terri. Great suprise seeing the flowers inside. the blue cup is really charming. What a surprise to discover those orchids inside.Thank you for giving all the chance to win such treasures. I would love to be included in that giveaway. Thank you for hosting this sweet event. The cup is so beautiful, I love the sweet flowers in the buttom and the blue color is so lovely. What a beauty!! I would love to be entered and I am already a Follower! What a beautiful cup! Thanks for hosting today. Your summer teacup is exquisite! I adore the gold filigree pattern on the plate. Thank you for hosting each week and I would love to enter your drawing. What a lovely cup, how can you bear to part with it. I have to say that is a beautiful cup, but I have no cups to share. Oh I do love this teacup! It is such a beautiful teacup in my favorite color. You are right, it is also summery. I would love to win this. Thank-you so much for hosting Tea Cup Tuesdays, I enjoy them very much. What a generous giveaway - love teacups with something at the bottom of the cup!!! June is going to a special month. I can just feel it! Beautiful cup and thanks for giving me a chance to give it a good home! Happy Tea Day! Oh, what a lovely cup, Terri. I particularly love the pink flower bouquet at the bottom of the cup and on the saucer...I do like the ferns, what a fun twist from regular flower leaves! To be sure this will put a smile on someone's face. Thank you for your month giveaway-you're a dear! That tea cup definitely says "SUMMER" - what a lovely choice. I must begin collecting tea cups, alas, at the moment I have none to post but hopefully soon! Like some others I forgot to mention I am a follower and a subscriber. So nice to meet you Terri. I have signed on as a follower. 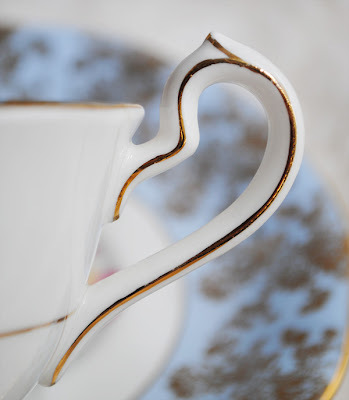 You have a lovely blog and this teacup is precious. Wishing you a good afternoon. I love this set. What a lovely shade of blue and the gold just is perfect with the blue. The pink in the flowers is like the icing on the cake. Beautiful! thanks for the opportunity! I'm always happy to visit with you. I am so in love with this cup -oh my goodness it is exquisite! Thank you for sharing and hosting our tea party! Have a great week! oohhh...of course I am following and would love to be part of the giveaway! Really I love all them! Wow...stunning..super beautiful..and mega-gorgeous! Another charmer..and oh my,you are so super generous Terri! Bless your sparkling heart!Whoever wins this beauty will be thrilled...Love it! Wishing you a happy week and wkd ahead! Shine on..
What a beautiful tea cup. I love the soft blue color and the flowers add just the right touch of style. What a lovely cup...like all your others...I can't beleive you are giving it away, but if you must please enter me in a chance to win it I would love to add it to my petite collection. I've run out of cups to share :( must go shopping. Thanks for offering such a fabulous giveaway and for being such an inspiration. Hi Terri, thanks for dropping by my blog and leaving your lovely comments. Yes I do love beautiful tea cups, but I don't have a big collection. The one you are giving away is just beautiful, such a soft pretty blue and so elegant with the gold flowers.. Happy Tea Tuesday to you. Thanks for your lovely comments as well Terri. 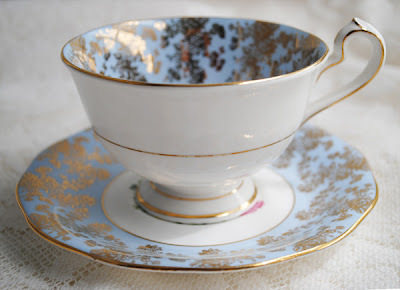 I love the color combination in the tea cup...it is elegant and shabby...just gorgeous! Just wanted to say thank you for stopping by my blog and following me. I found your site through the link up at Comin' Home. I am now a follower. What a sweet teacup Terri! Love your blog and enjoyed my visit! What a beautiful cup! I love the delicate blue and gold pattern and the unusual looking orchids. Thanks for the great June giveaway. I love when there is a surprise image at the end of a cup of tea. I'm also a backstamp junky! Beautiful cup! I must tell you about the most delightful family. The mom is Patricia Cabrera. She has 7 children. She and her children are puppeteers. Patricia and her family, make the stages, the marionette dolls, the clothing, the scenery, etc. for their live productions. I just bought their 'Cinderella' DVD on Patricia's Etsy site, which goes by her first and last name. Patricia is a fabulous watercolor artists, reminiscent of Tasha Tudor. Ah! and that is not all either...they live in North Carolina and have a farm and raise goats and make wonderful natural based items like soaps, etc. It is like Tasha Tudor has been reincarnated again in North Carolina! One of their blogs is Woolytales blogspot. Oh, their children sing, and one plays the piano to accompany the plays. They just released their second production 'Snow White' in DVD. Anyway, I know you love creating things so thought I would share this delightful family with you. Oh, and please add me to this lovely tea cup giveaway. Another beautiful giveaway!!! I always look forward to your teacup share posts :-) Thanks so much! What a gorgeous tea cup, I love the pattern and the colors, so very elegant! What an amazing giveaway, thanks for the chance to win! Terri! happy Tuesday Cup day! this is Sunday and what a delight to see such a lovely tea cup. I do not have a a Queen Anne tea cup. the blue and the floral design is just beautiful! Please enter me in your June giveaway! Thanks. I am a follower of yours and enjoy your blog! I love tea cups and I love tea, this tea cup is especially lovely. I am a follower of your lovely blog and would love to be entered in your giveaway. Actually I have just prepared a cup of tea and plan to spend some time enjoying it. Really beautiful. Oh how lovely the tea would taste i a cup like that. Hello Terri. Thank you for your comment on my blog. That beautiful blue teacup is from Russia. It is the Singing Garden pattern from Lomonosov, and I just linked that post to your lovely linky party. Thank you for hosting. I'm a follower, and I so hope to win this teacup giveaway. Terri, thank you for letting me know about his giveaway. All three of your giveaways are so pretty. 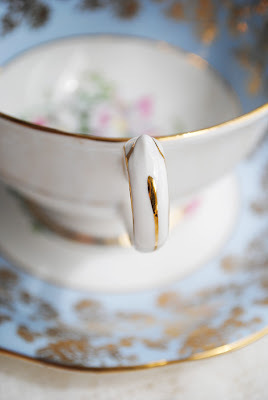 I really love the pretty blue teacup and would love to have a chance to win it! Well, I don't know how I missed seeing this beauty! I love the color, and the sweet flowers. What a beautiful giveaway! Love your blue tea cup with roses! I would love to win - I'd display it with a little green one that is very old and somewhat similar with the little rose thing happening. I've been enjoying your tutorials - I need a few months off in a studio by myself to just play around with all the fun ideas! Alas - I shall content myself with a crafty moment here or there - and regular visits to your Artful Affirmations! The teacup is gorgeous! I can't believe you are parting with it. Please include me in the chances to win. You've got me thinking I am due for another giveaway on my blog. Take care Terri! It would be my first. I am craving a teacup!!! That is a beautiful teacup. I personally collect antique sugar bowls & creamers. I think it would look beautiful in my antique china hutch with all my antiques. You are so generous. Pink and blue - one of my favorite color combinations. Those flowers look so inviting. I love getting the information along with seeing your wonderful collection of cups. Sometimes I goof up on the computer, if I've done it again and 2 comments post, I apologize now. I don't have a teacup with orchids, count me in please. I enjoy your blog and the tutorials. What a beautiful blue teacup and would love a chance to win it . I've been checking your blog each Tues. to see your post on your lovely collection of teacups. I love this beautiful tea cup and saucer! I am always anxious to see your newest posts, and love your blog and tutorials--I've been a follower and a big fan of your art ever since I found you! Thank you for hosting tea cup Tuesdays. I am always amazed at such wonderful works of art and am also a lover of odd tea cups.This one is an absolute gem with those pretty orchids! Please count me in for this fabulous giveaway. I love this teacup! I am bot ordinarily a big fan of blue, however, this is soooo sweet. I would love to add this to my collection and I am, of course a follower. Love the tea cup! Please add my name to the hat! Love the tea cup! Please put my name in the hat! This tea cup is soooo lovely! Terri - oh I simply must have it for my tea cup collection *chuckles* I'm in for the win! Gorgeous! I would not want to miss this one! Please count me in! Thanks a lot! arriving here from the tea party, I'd love to be in the running for this beautiful tea cup! Lovely cup. Makes me think of the ones my mother had. Still don't know where they went. Lovely cup. Can't wait for the drawing. Also,I plan to try your tissue paper printing as soon as I purchase new ink cartridge. Really love that look! I must have this also. Such a pretty tea cup! I would be honored to have it as the first English tea cup in my soon to be collection. (I only have japanese tea cups right now) Thank you for sharing such a lovely! what a beautiful teacup. I've collected teacups for some time, and it is addictive!